We expect you all have been hearing on the news that the racing is closed down for a few days due to an outbreak of Equine Influenza. This to be fair is mainly a precaution and therefore restricting the spread of the outbreak. It has come to our attention that any yards that have had runners at meetings where horses from suspected infected horses are have been put on lock down till all their horses are tested. 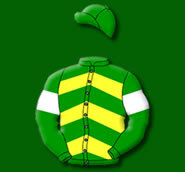 So runners from Wolverhampton on Monday & Wednesday; horses that ran at the jump meetings Ayr and Ludlow have all affected thus far, luckily not us. We are doing are best with precautionary steps of extra deep disinfecting, and maintaining our general washing and cleaning. In an attempt to limit the spread The Jockey Club has requested no outside trainers bring their horses on to the Lambourn Glallops for the forseeable few days. You would think that the very cold few days we had, with temperatures as low as -16 in places in Lambourn on Sunday, that it would have filled those bugs off!